St Cuthbert's Way might have suggested something too religious for us; what interested us was a walk across beautiful Border country, framed by his early training and his death. 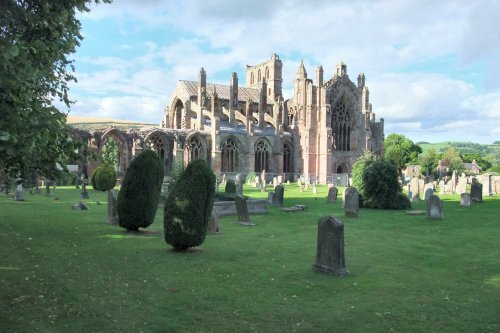 He was a trainee and then Prior at the monastery in Melrose; and later on, Prior at Lindisfarne; this gave us a good beginning and a fine end. 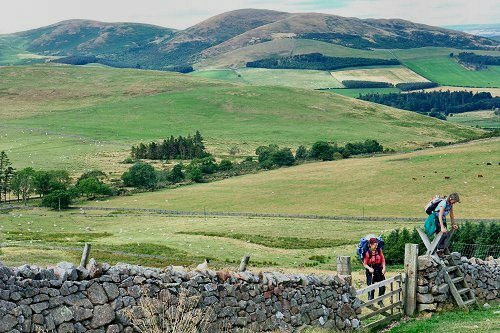 Walking across the Cheviot Hills was a magnet, and the Northumbrian Coast is famous for its Castles and big skies. The long-range forecast was not good, but the weather turned out to be well-nigh perfect. We also thought that going north from London might be colder, but it wasn't. And we were able to visit an old friend and colleague who had moved to Kelso. Arriving in Melrose the previous evening (after a bus journey through many little Borders villages), we were struck both by the prettiness of the town, with attractive red sandstone buildings and lovely flowers. Everywhere there were hanging baskets and filled troughs; this place was well cared for. The slanting sun warmed the shell of the Abbey. It was a grand, old building, with elegant shapes around the windows, like a skeleton of history. This was a great religious structure, though after Cuthbert's time; it spoke of life in an era of worship. Jeremy's head came up with Shakespeare's 'bare ruined choirs', while mine kept hearing Peter Pears' voice singing Britten/Tennyson 'on castle walls'. Right at the start we understood Melrose's pride in itself: we met some Melrose in Bloom volunteers, who told us it was the best place to live. The path from town went up between two fields, with contrasting flocks of sheep: whites on the right, browns on the left. They kept up a constant bleating at each other; it probably went on every morning. Jeremy had just read about the 13th century English massacre of the Scots at Berwick; so we decided this was one border dispute that we should walk away from! 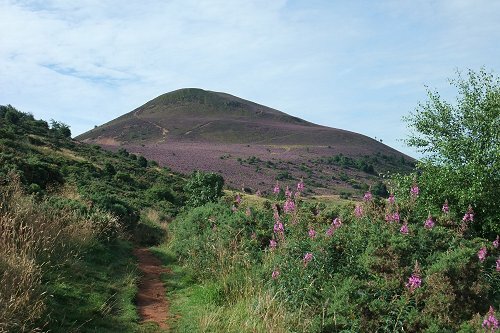 The Eildon Hills, three cone-shaped outcrops, were formed by volcanic activity some 380 million years ago. They were covered in mauve-pink willow herb and heather; it took us less than an hour to reach the col. The sun was out; there were mackerel clouds; it was a lovely day to climb the extra 15 minutes up to the top of Mid Hill, where we got a splendid view all round. There were blueberry plants at the top, and heather swept across the flanks of the hill, smearing the scene in mauve-purple; it was humming with bees. This was all a good excuse to talk about geology - the meeting of tectonic plates producing volcanic action, many millenia ago, when this land was down at the Equator; the heather being an acid-loving plant, was probably happy on the lava-ground. We went on down the hill, through a tiny village, and along the Bowden Burn. After Newtown, we joined the River Tweed, wide but not deep. At St Boswells we bought a picnic, walked through the smartly manicured greens of the Golf Club, and found a peaceful spot for lunch on a bend in the river; sunshine, birdsong, the wash of the water, a small family of ducks on the opposite bank, and a can of cider each, all made for a very pleasant rest. The tiny village of Maxton had a little old church connected to Cuthbert. Then we got onto the Roman road Dere Street; it was not actually as straight as the name suggested, and we rambled through trees and fields, with golden barley waving in the wind. The Lilliards Stone turned out to be where the Scots and English met to discuss their differences; it gave us more views. A little further on, the Waterloo monument stood out proud (and a little vulgar) on the open plain, behind Pond Wood. There were many fine trees - tall firs, gnarly beeches with thick trunks and swirling braches, reminiscent of the whomping willow in the Harry Potter books. We were impressed by the well-kept countryside: freshly mown grass verges, all a vibrant green, from lots of rain; the beech hedges were well-shaped; and the Way was well-managed, regularly marked with crosier signs and neat wooden steps, up and down the inclines. The whole day was also punctuated by stops at wild raspberry bushes. Then we went down to Harestanes Visitors Centre, were we met our friend Steve, with whom we stayed; so we had an amicable evening, catching up on the gap since they'd moved back to Scotland. After a brief look at the craft shop at Harestanes Centre, we went back into the woods, past Monteviot House (home of Tory MP Michael Ancrum) and down to the River Teviot, faster flowing than the Tweed; next we branched off, over the suspension bridge, and soon along Jed Water. Up the hill, our last bit of Dere Street had a few cobbled stones that might have been laid by the Romans. Again we were lucky with the weather: a bright, sunny day, with a few breaths of refreshing wind. 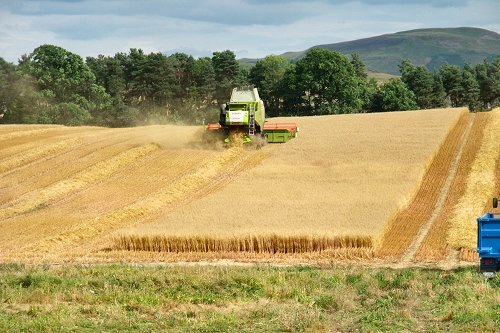 The land had pleasing, undulating curves, with hillsides covered in ripening crops - as yesterday mostly barley, plus a few peas. The views were a mixture of golden fields, deep green copses, with some lines of blue water in the valleys. Again the trees were lovely: some splendid grand beeches and a few avenues of tall firs, giving welcome green shade and peace. We didn't meet any other walkers all day. We crossed Oxnam Water and climbed above Coldhough Bank, pausing for our picnic with a broad view back the way we'd come; the volcanic hills and the Waterloo monument still loomed in the distance. The afternoon continued with more sheep, cattle and cultivated fields, and through further attractive woods. Wild raspberries detained me again; Steve was with us, and he lingered too - at least I had company in my fruit picking. The old ruins of the red sandstone Cessford Castle spoke of more warring events between Scots and English. In the warm, late afternoon sun, we watched the farmer on his combine harvester, reaping his oats, mowing up and down a big field of golden plants. Arriving in Morebattle on a small road turned out to be a small minus: it was busy with the evening rush hour. We'd tried to set the world to rights in our afternoon conversation, but we saw we'd failed: the landlady at TempleHall Inn in the village told us she'd had to pay more than a thousand pounds to the PRS for her music license - nice for us as musicians but too much for a pub in a tiny village. However, we had a very friendly conversation; and the village chit-chat made it feel like a true 'local'. They put us straight on the meaning of the hamlet's name: settlement by the lake (not more warring). Steve's wife Catherine collected us, and we went back 'home' to Kelso. We left Morebattle by little roads, crossed Kale Water and set off uphill on Grubbit Law; wonderful names round here. Low grey cloud covered the sky, the wind was a little fresh, and so the temperature was a bit lower; we had a steady climb upwards. 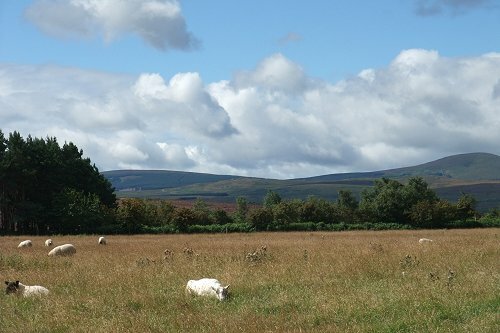 This gave us ever expanding views of the Cheviot Hills: gently undulating mounds of yellowing green; there were not many trees around, just a few patches of what looked like Forestry Commission. Then Steve turned back and we pushed on to Wideopen Hill (appropriate names department). There was a small notice here stating it was the mid-point of the Way and the highest point at 369m. It certainly had a splendid 360 degree view of what I call 'the heaving seas' - smooth glacially-formed humps, bumps and valleys. We paused for a sandwich, avoided a brief shower, and then ambled on down towards the valley of Bowmont Water; there were more farm settlements, arable land by the water, and fields of bleating sheep, with surprisingly white fleeces. We tried for a place by the river for the rest of our sandwiches, but it was all farmed fields. Then we walked into town on a quiet road, followed by a path by the river. Kirk Yetholm had a prominent church, a pleasant village green and a nice little hotel. Here Steve and Catherine arrived, and we met up with our next walking partner, Sue; the five of us had a convivial evening, with me acquiring a new taste for the deliciously smooth Jura whisky. This day's beginning was also the end of the Pennine Way, on a small road leaving town. At Halfwayhouse we crossed Halter Burn and climbed up Green Humbleton, soon passing from Scotland back into England. By contrast to the solitude of the previous days, there was more company today, in the form of lots of people doing the St Cuthbert's Challenge Walk - a 20 mile circuit, done to raise money for the local Mountain Rescue. Indeed the day was also peppered with chats with their volunteers (salts of the earth) who were supporting the walk. Fortunately there were no casualties. This was a lovely August Saturday, with mixed sun and clouds - actually a perfect day for walking; so it might have turned some people on to do more hill walking. For us it was another splendid day, with broad, open views of the Cheviots; it was mostly rolling hills, with a few sections through the woods - usually mono-culture firs, planted so close it was rather dark and not much grew on the ground. We skirted Ell's Knowe and passed a farm at Elsdonburn. After Hethpool, it was through another wood and then a pause for lunch (with plenty of walkers going past). The afternoon was a bit like crossing a huge moor covered in mauve heather - I've never seen such a big expanse covered in this very attractive light purple, with a wonderful sweet smell. It reminded me of southern European lavender fields. After a while, we realised we could see the sea. Then there was a dramatic, dark sky to the south, but we didn't actually get rained on. The surrounding lumps had other striking names, like Yeavering Bell and Tom Tallon's Crag; generally they were elegant curves in the landscape. There were a few sheep around, and we passed a couple of sheep pens, which could have had weekly sheep markets. We ambled down through bracken and long grass to Brown's Law; the name seemed similar to the Derbyshire Low, actually meaning hill. Then a dogs-leg path took us through the next wood of Christmas trees and down to Wooler, a pretty market town, with lots of pubs. It had been a fine day of wideopen views, curving hills and gorgeous heather. Overnight Sue had bivouaced by Wooler Water, and was visited by a heron in the morning. We met her having breakfast at the Market Cafe and left town passing the finest lawn I have ever seen: a bowling green with close growing grass, finely mown and not a weed in sight. Soon we were climbing up to Weetwood moor. Again the weather was better than expected - it was a beautiful sunny morning, and the view spread out around us, with typical huge Northumbrian skies above. Weetwood Bridge was a rather grand Victorian affair, leading nowhere in particular; (a folie de grandeur?) In West Horton, a flock of swallows had settled on the telegraph wires, rather like notes on a stave, ready for migrating. As before, the farms around had a mixture of grain fields, cattle and sheep. Over lunch we basked in the sun, then a short shower swept past as we made our way up to St Cuthbert's Cave, where his remains were kept when the Vikings came. It was a big set of sandstone rocks, with heather growing above and some Caledonian pines on top. Then more farms and small woods - part mono-culture firs, part a more interesting mix. Next a longer path through Shiellow Woods. 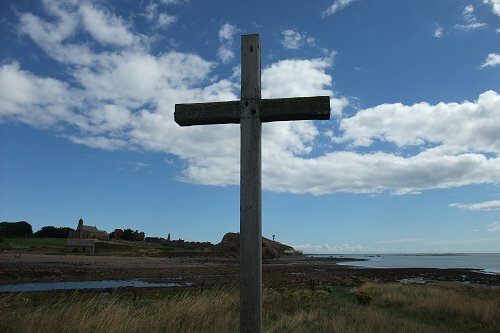 After that, over the final hilltop before the coast and a splendid view across the Sea to Holy Island, with the Causeway showing, thanks to the low tide. The late afternoon sun picked out the Castle and yellow sandy beaches; finally we were into the little Hamlet of Fenwick. The Lowick pub collected and returned us, around serving a meal (and more Jura whisky for me). Another bright morning gave us the now familiar freshness. Crossing the busy A1 wasn't difficult, and then it was via a few more fields to reach the car park by the Causeway. We chose to follow the posts in the mud, marking the Pilgrims Path, at first bothered by the noise of motor transport, but that receded before long. It was a little over an hour's walk to cross the mud and sand flats; squelching between our toes, the mud varied between cow slurry and something more silky. The still flowing-away tidal streams were a bit firmer underfood and so easier to walk on. The silhouette of the Castle grew steadily and we were pleased to reach our destination - another place where St Cuthbert's remains had been kept. However, the Island is a big tourist magnet and we were a bit shocked at the numbers of people; the contrasting elements of tourism and spirituality were set amongst dinky houses and a wide seascape. Paying our final respects to St Cuthbert, we visited the Priory, where he'd been Prior, and his remains were first buried there. After a light lunch at the Post Office cafe, we ambled round, starting with visiting the Castle, built on top of a dramatically spiraling rock. Also, it was a rather dark afternoon and the place felt oppressive, not least from the associations of Roman Polanski's film Cul-de-sac. The bright colours of Gertrude Jekyll's Garden improved the day, and then we set off along the northern coast to look for fossils, without much result. Occasional spatters of rains and a fresh sea breeze made for a cooler day. Our objective had been achieved, so it was off to celebrate with more Jura whiskey at The Ship. 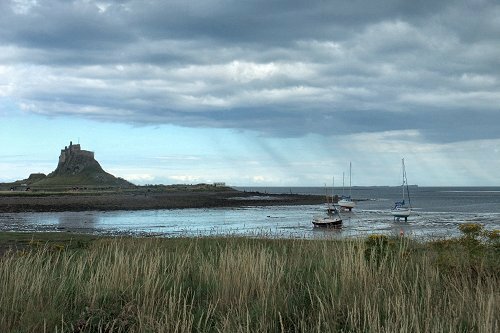 Starting from the panoramic views of the Eildon Hills, via the broad sweep of the Cheviots, to the coastal plain and the low tide walk across to Lindisfarne, this was an enjoyable walk. Doing the journey in summer meant there were lots of flowers and productive farms. Including the dramatic skies, we were lucky with the weather. No day was over strenuous, it was well varied, we had good food and drink (Jeremy found some tasty real ales), and the underlying theme of visiting places associated with St Cuthbert gave it a satisfyingly thoughtful base. 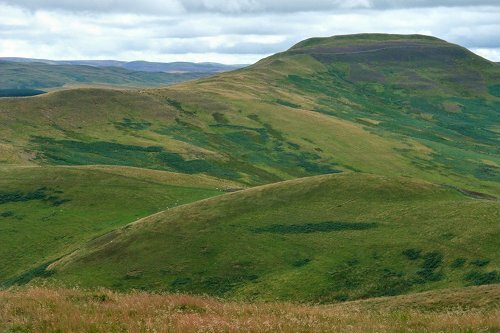 Northumberland lived up to its reputation in landscape and venerable history.